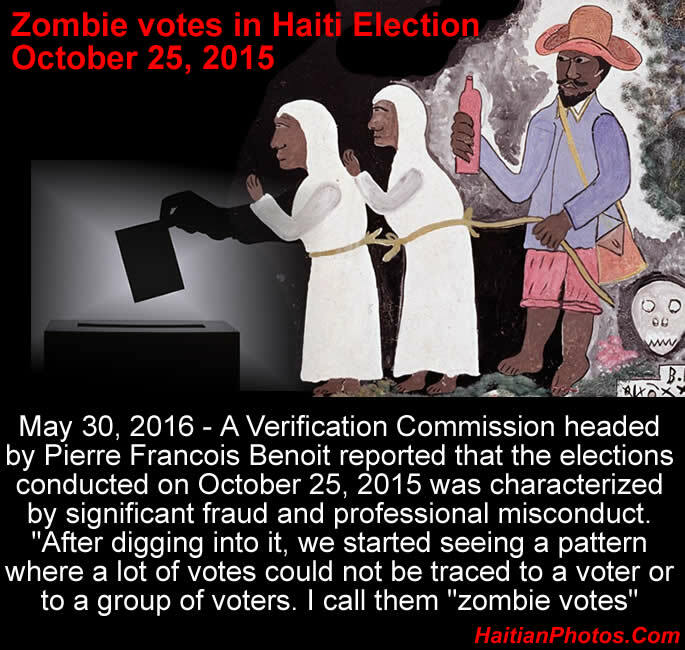 Toward the creation of a Verification Commission in Haiti. 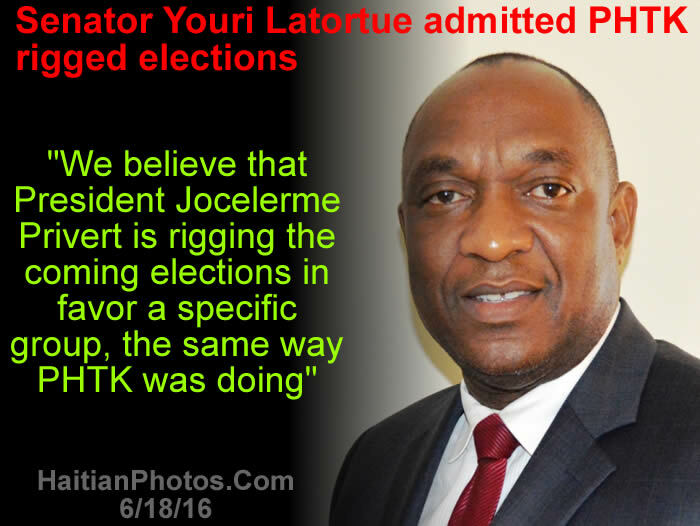 On Monday, April 11, 2016, the Interim President Jocelerme Privert sent letters to all political parties, whether represented in the Parliament or not, to discuss the establishment of an Electoral Verification Commission. The discussion would start from April 12, 2016, as per the terms of the Commission as mentioned before. The Head of the State has said, it is his obligation to define the role of the Commission based on the consensus of all involved stakeholders to avoid all future crises. 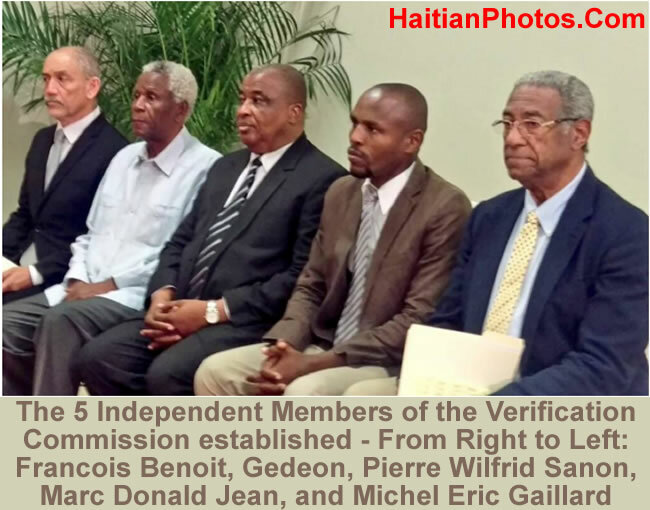 We might remember that in last month, even the Haitian Human Rights Leaders, composing coalition of RNDDH, CNO, CONHANE and SOFA, had recommended the necessity of a verification process to uphold Haitians' right to vote and to avoid a major political and electoral crisis. 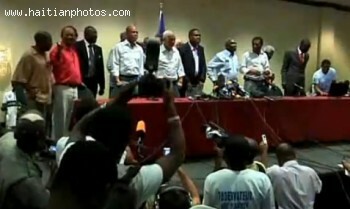 Here is a picture of twelve out of Haiti's 18 presidential candidates making a public statement on the day of the election. They say the vote should be canceled because of massive fraud. Numerous occasions of electoral fraud were recorded on the day of the election. 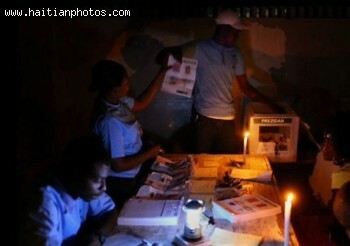 Voter intimidation and gangs entering polling stations and stuffing ballot boxes with candidates of their choice. There were also many incidents where voters showed in the polling places and not being able to vote. Considering that people are not allowed to drive on election day in Haiti, It was reported that some voters had to go to four or five different voting stations before they could cast their ballot. Here is Haiti President elect Michel Martelly following Official results of Run-off election. 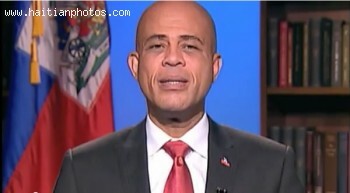 The G8, Fanmi Lavalas and other opposition parties are not satisfied with the announcement of 'Commission of Electoral Evaluation' by the Martelly administration. 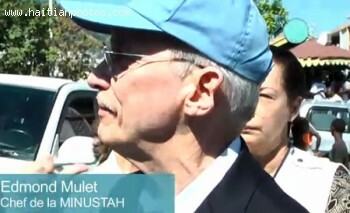 They, along with other independent observers and U.S media like 'The New York Times', are of opinion that the October election in Haiti, to choose a successor to President Michel Martelly, has been marred by so much ballot tampering, illegal voting and other abuses that it could be denounced as 'illegitimate'. 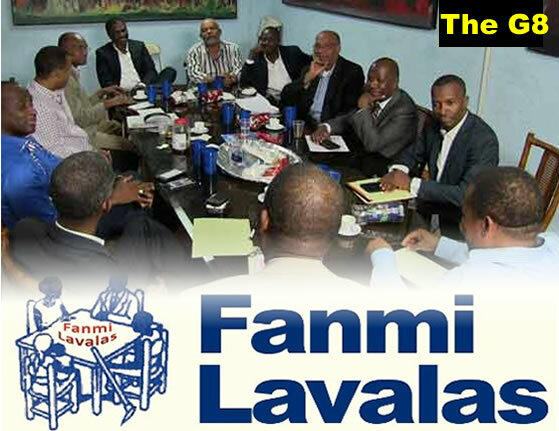 Some of the observers are of opinion that if G8 could find a consensus and form an alliance with Fanmi Lavalas, and all the opposition can stand up as one man against Martelly's handpicked successor Jovenel Moses in the December 27th election, they would be able to prevent the forceful imposition of Jovenel Moses as Martelly's successor. 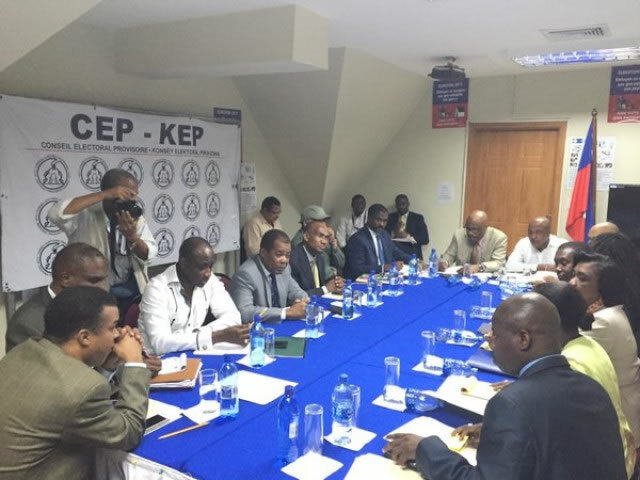 Here is a picture taken during the meeting between the CEP and the opposition in Haiti. 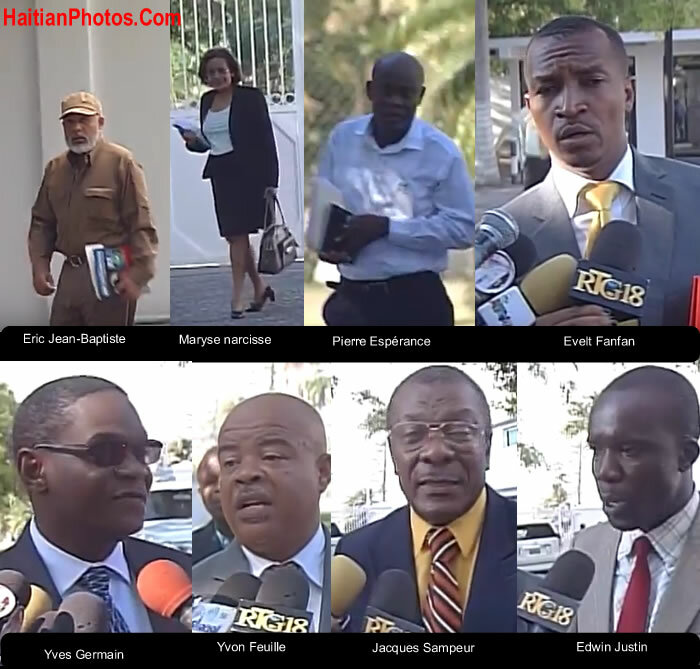 Following a joint note from the eight candidates (G8) representing 49.81% of total votes, requesting the CEP to form an independent commission to inquire about the alleged frauds affecting the integrity of the October 25, 2015 election, the CEP's arranged to meet these Presidential candidates on November 23, 2015. The eight candidates who were present during the meeting were: Jude Celestin, Jean Charles Moise, Samuel Madistin, Sauveur Pierre Etienne, Eric Jean Baptiste, Steven Benoit, Jean Henry Ceant and Mario Andresol. However, the candidates came out of the meeting dissatisfied, because each of them attended the meeting to satisfy own interests which were conflicting with one another. Furthermore, they could not reach a consensus about the constituents an acceptable "Independent Commission". In a situation like this the CEP has given a stern negative response on forming an independent commission.